Best Warm Mist Humidifier • The Air Geeks, reviews of air conditioners, dehumidifiers and air purifiers. The warm mist humidifier is a device that diffuses a soft and warm vapour into the air. This humidifier works on the principle of evaporation. Generally, a warm mist humidifier has two electrodes that boil the water in the tank before turning it into steam. You will not risk any burns as this steam is cooled before being diffused into the room. However, it is advisable to keep children away from this humidifier, as an accident can happen so quickly. For The Air Geeks, the best Warm mist humidifier is the model H8000B by the brand PureGuardian. Operation: Has a well operational touch display. It is ultra-quiet. A good-looking, reliable option for those who intend to use a warm mist humidifier for their home, at an affordable price. What else could we ask for? How does a warm mist humidifier work? By boiling the water, the warm mist humidifier removes all bacteria from it. This is the main reason why it does not need filters. Some users are reluctant about the real efficiency of the hot air humidifier. In fact, all types of quality humidifiers are equal in performance, but some users prefer cold steam to hot steam. So it’s all a question of preference. It is possible that a doctor may recommend one over the other, but for a steam with a “curative” purpose, the warm mist humidifier is undoubtedly the best choice. Why should I use a warm mist humidifier? With so many humidifier options out there, it can become a daunting task to choose the right one for your needs. If you don’t like having to regularly clean humidifier filters, then a warm mist humidifier should be a better option for you. This is because no filters are needed to operate this type of humidifier as water is evaporated by heating it before diffusing it to the air. Also, since the humidifier heats water the water in the reservoir tanks, it is more difficult for bacteria and mold to grow in such conditions and this ensures you appliance stays clean for longer periods. Do warm mist humidifiers help with allergies? One of the most problematic seasonal indoor allergens is caused by dust mites. Having a humidifier that ensures that the humidity is maintained at 40% -50% is crucial to keep the mites off the house. Are warm mist humidifiers good for babies? Warm mist humidifiers are recommended by many pediatricians as they have the capability to kill germs present in the air before it gets to the child’s nose. They also help reduce mucus build up due to infected nasal cavity and sinus inflammations. 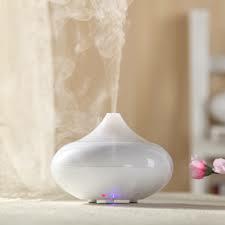 Some caution, however, should be taken before using a warm mist humidifier in the baby’s room. You should make sure you have a safe spot away from the crib to ensure it is unreachable. Humidifiers can appeal as fun toys to kids and so they will try to play with them. You would want the hot water to spill on your child if the accidentally tip the tank over themselves. Thus, it is very important to ensure that the humidifier is placed in a safe place that is inaccessible to the baby. Are warm mist humidifiers good for colds? Though both warm and cold mist humidifiers are effective in preventing colds, the warm humidifiers are particularly effective since they actively kill the cold-causing viruses and germs. This ensures you remain susceptible-free from respiratory infections such as cold and sore throats during a cold and flu season. You won’t have to keep purchasing over-the-counter drugs every time the cold season kicks in as the humidifier will keep you covered. When to clean a warm mist humidifier? Compared to their cool counterparts, warm mist humidifiers are easier to clean. This is because you will only have to focus on the water tank and not filters in ensuring that they are well maintained. As the humidifier gets used over time, lime scale develops on the heating element which may hinder proper operation of the humidifier. However, with some little vinegar and a toothbrush, this should loosen the deposits and ease their removal. Use some soft cloth to wipe out the powder once scrubbed and the device should be good to go for another couple of weeks or a month depending on your usage.